The idea was to have friends pose for the project, with the caption, for instance, ‘Holly for the laex project’. So and so for the laex project, etc. Then, on a trip to Peru and the Amazon rain forest, take some scarves with me, hang them up on around the forest and take picture. The caption, ‘the laex project for the Amazon rain forest’. Cool. The laex project pronounced l-a-x , for those that want to know, is an introduction to an artist and their work and, hopefully, something that will enable them to earn something, while promoting their talent, while at the same time scratching another itch. Ethical consumerism has been on the rise for more than twenty years. More and more companies have more to their business plan than just profits. They want to achieve or support changes in the world and in the way the economy works. The leax project is proud to be a part of that movement. We’re starting with fine art scarves. I say we because nothing we do is really alone and the laex project is no exception. When we’ve got the scarves up and running the sky is the limit. Ten percent of the retail price will go to the artist whose image is on the scarf and ten percent, or planting a tree for every scarf, which ever works, will go to a reforestation/conservation project. A subject very dear to me and important to the world. We’re looking for suitable project partners such as a project called Arbolivia, that’s arbol, Spanish for tree for those like me who took while to get that, and Bolivia. They are building a project that makes the conservation of the rainforest profitable rather than just deforestation and are very worth checking out, arbolivia.org.uk. Why not just make the scarves twenty percent cheaper? Well, for a start that would make them just another scarf, secondly our creed is our advertising. Just as some companies sponsor a sport, we’ll sponsor trees and up and coming artists, two of my favorite things…just take a look at a map of what’s left of the Amazon, and tell me it’s not scary. I can see a future where we as consumers look for what a product supports. 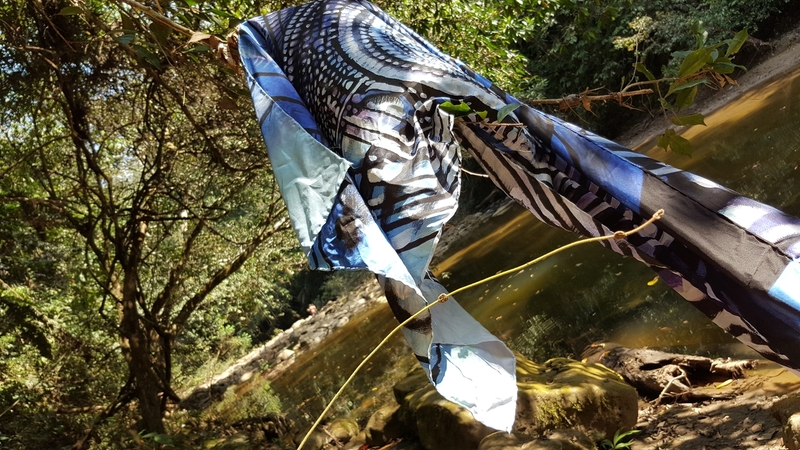 So, that trip to the Amazon jungle, with some of the scarves for some photos. Unfortunately my luggage was delayed until I got back from the jungle. I had one scarf in my hand luggage, and did managed to get one photo. See above. The laex project for the Amazon rain forest.